If you have a great idea for a medical device or have already founded your own medical company, chances are that you’ll eventually need to secure some funding to bring your product to market. Medical device venture capital (VC) firms specialize in providing startup technology companies in the medical sector with the capital, resources and expertise they need to grow their companies, mature their technology, establish compliance with regulatory bodies and bring their products to the marketplace. Choosing a medical device VC firm to partner with for your company’s future is as much about finding the right fit as it is about getting the best deal. A venture capital firm with connections and resources in your niche is an extremely valuable partner, and you’ll find that many MedTech VC firms focus their investments on just a few types of medical devices. To help connect your organization with the biggest players in medical device venture capital, we've created this list of the top 20 most active venture capital firms in the medical devices sector. These organizations topped our list by completing the highest number of medical device investment deals between January 1st, 2013 and the present day, according to CBInsights. We've ranked investors by total number of deals over the past five years so you can see what firms are the most active and aggressive in funding and supporting medical device development. In addition, we're also providing highlights from each firm’s portfolio to help you identify a partner whose specialties line up with the problems that your medical device company is trying to solve. NOTE: Once your medical device company is funded, you will need to consider these 15 Items Medical Device Startups Must Address, including implementing a Quality Management System. Free Download: Grab your PDF copy the Ultimate List of Medical Device Venture Capital Firms here. New Enterprise Associates is a full service venture capital firm that makes investments ranging from $50,000 to $20 million in companies in virtually every sector of the economy. The venture capital giant focuses on new and emerging technologies, funding projects in big data, financial technology, cloud computing, solar and nuclear energy and semiconductors. On the medical side, they've invested in healthcare service firms, healthcare IT products, life sciences, biotechnology and medical devices, completing 65 medical device investment deals over the past 5 years. A truly global firm, New Enterprise has funded companies worldwide in places like China, India, Brazil, and across the United States. The firm is based in Menlo Park, California. Versant is a leading investor in the biotechnology, medical devices and health care space, helping exceptional entrepreneurs with great ideas make a difference in the global healthcare marketplace. The firm invests in projects across the healthcare sector and at various stages of company development, but focuses on firms developing novel therapeutics. Versant's website boasts that since its inception in 1999, it has helped more than 65 companies achieve successful acquisitions or IPOs. Founded in 1989 and based on the 54th floor of 601 Lexington Avenue in New York City, OrbiMed has funded and launched numerous companies in the healthcare sector. Its portfolio companies include innovators in biopharmaceuticals, medical devices, medical imaging and diagnostics, healthcare services, and healthcare IT. Portfolio companies of OrbiMed are working to extend the human life span by developing technologies of the future such as immuno-therapies, gene therapy and gene editing. OrbiMed is one of the most active life sciences investors in both Europe and North America, completing 37 investment deals with medical device companies in the past 5 years. High-Tech Gruenderfonds, also known as HTGF, is a unique venture capital firm that operates as a public-private partnership, with investment from the Federal Ministry of Economics and Technology in Germany, the KfW Banking Group and 39 Germany industrial groups, among other investors. The firm primarily invests in high-tech projects across all sectors, typically contributing up to 1 million euros in the seed stage with the potential of additional investment in later rounds. HTGF has an impressive portfolio of approximately 490 companies, employees 50 people, and manages assets that total nearly a billion euros. The firm is based in Bonn, Germany. Johnson & Johnson Innovation is a subsidiary of Johnson & Johnson that focuses on the development and advancement of new healthcare solutions, including pharmaceuticals, consumer products, and medical and diagnostic devices. The firm leverages its extensive infrastructure and resources to provide entrepreneurs with equity investments, licensing, collaborations, office space, and modular lab space. The firm establishes regional incubators where entrepreneurs receive funding and resources along with training in business and product development. Johnson & Johnson Innovation maintains offices in Boston, California, London and Shanghai. Founded in 2003, BioStar Ventures has established a reputation in a short time as a reliable investor in disruptive cardiovascular and orthopedic medical devices. The stated aim of BioStar is to invest in companies and technologies that address unmet health and economic needs, and so far the firm has succeeded in helping 18 of its portfolio companies to successful market exits, including five in the past five years. BioStar offers investments in seed, early, growth capital, first revenue, first or second round and later stages, and typically invests between $250K and $1 million initially, and up to $6 million total in its portfolio companies. InterWest Partners is a Menlo, California-based venture capital firm that focuses on investment in life sciences companies that are in the pre-clinical- and clinical-stage of product testing, as well as companies that are ready to enter the marketplace. InterWest focuses on technology companies, including SaaS and enterprise software and services, but its investments in the life sciences are extremely diverse, encompassing everything from oncology solutions to personalized medicine and orthopedics. InterWest preferentially funds American companies and typically invests between $2 million and $25 million over several rounds of financing. Domain Associates is one of the largest MedTech venture capital firms in the United States, having invested nearly $1 billion in over 260 medical device companies over its 30+ year history. This private equity and venture capital firm specializes in providing incubation, seed money and growth capital to start-up companies in the healthcare sector. Domain Associates preferentially funds companies with a focus on healthcare, especially pharmaceuticals, drug and device sectors, therapeutics and medical devices. The firm has also invested in biomaterials, clinical diagnostics and healthcare IT companies. Domain Associates prefers to invest at the first institutional financing round, and typically invests between $10 million and $25 million. U.S. Venture Partners is a venture capital firm that invests in healthcare and medical technologies, enterprise service technologies, internet security technologies and consumer retail products. based in Silicon Valley, the firm has invested in over 400 companies across its 30+ year history, including some well-recognized brands like GoPro, Sun Microsystems, and SanDisk. USVP's expertise in business scaling and product development are assets to its partners, along with the extensive financial support that USVP can provide. The firm typically makes investments of between $10 million and $25 million dollars, especially in markets where the revenue potential exceeds $1 billion. The team at SV Life Sciences is driving innovation across the medical devices industry with over $2.7 billion in capital under management in seven private healthcare funds and one publicly listed fund. For entrepreneurs seeking funding for a new medical device, SV Life Sciences can provide all of the financing and resources required to take your product to market faster than you ever thought possible. The firm focuses on companies operating in the healthcare sector, specifically those developing in-vitro diagnostics, medical devices and instrumentation, therapeutic proteins and antibodies and healthcare IT solutions. SV Life Sciences is based in Boston, Massachusetts. Established in 1989, Connecticut Innovations (CI) is the self-described strategic venture capital arm of Connecticut and an active investor in healthcare IT, medical devices, and bioscience companies. One thing we love about Connecticut Innovations is the transparency they offer - featured on their website, prospective partners can review detailed financial information for the firm, including total transaction dollars, total additional capital leveraged and even the number of jobs supported by CI's active portfolio. The firm's fiscal year-end report for 2018 indicates $170.8 million in assets under management and 116 unique companies that received financial assistance from CI throughout the year. CI has led twelve of its portfolio companies to exits via IPO and numerous others to lucrative acquisition deals with companies like HP, IBM and Gilead. With a history that spans over 50 years., Morgenthaler is one of the oldest and most successful venture capital firms in the United States. With a staff of just over 30 employees, the firm manages over $2.8 billion in assets, including shares in the popular note-taking app Evernote and a number of successful medical device companies. In the past 40 years, Morgenthaler has invested billions in over 300 companies across its venture capital and leveraged buyouts businesses. Morgenthaler's founder, David Morgenthaler, was even awarded the first National Venture Capital Lifetime Achievement Award in 1998 for his role in the development and emergence of the venture capital industry in the United States. Canaan Partners is a massive venture capital firm with investments in consumer technology, Fintech, enterprise/cloud and frontier technology, as well as a variety of digital health, biopharma and medical technology companies. Canaan focuses its medical device investments on innovative companies building solutions for gastroenterological surgery and cancer detection and treatment. Since its inception, Canaan Partners has propelled its portfolio companies to 62 successful IPOs and 135 mergers and acquisitions, raising over $5 billion in the process. Canaan Partners maintains offices in San Francisco and Menlo Park, California, as well as in Westport, Connecticut and New York City. Venrock is an American venture capital form whose history of investment into revolutionary technologies has positioned it as a leader in the technology space. Venrock's website boasts of its leadership in Apple's first investment round in 1978, its 1998 investment into the genome sequencing company Illumina and its 1999 partnership with Healthcare IT innovators Athena Health. Venrock invests in medical device companies that develop tools for minimally invasive cardiothoracic procedures, improve hearing aids and help increase the ease and safety of orthopedic surgery. Arboretum is a venture capital firm that specializes in investments in the healthcare sector, especially in companies that are developing new surgical and therapeutic technologies. According to its website, Arboretum Ventures preferentially targets capital efficient companies whose innovations can achieve cost reductions in Arboretum's areas of expertise, which include devices, diagnostics, services and IT. Arboretum is actively seeking new investment opportunities for Arboretum Ventures IV, a $220 million private equity fund raised in 2015. Accuitive Medical Ventures is a VC firm based in Atlanta, Georgia with a committed capital of $230 million. The firm works to identify medical devices and other healthcare sector products with strong market opportunities and establish investment partnerships that transform the healthcare sector. The firms looks for specific criteria in its investments, preferentially partnering with companies that offer an emerging medical device or technology and have the potential to serve a global market with over $500m in revenues. The firm seeks to make initial investments between several hundred thousand dollars and $3 million, while typically investing $4 million to $6 million through multiple rounds of financing. Established in 1998, Life Sciences Partners (LSP) is a Europe-based venture capital firm and one of the first to truly specialize in funding innovative and disruptive healthcare companies. The firm takes pride in having oriented itself towards the singular objective of seeking, nurturing and growing healthcare investment opportunities with the potential to have a positive impact on society. In the past 25 years, LSP has provided start-up and growth capital to more than seventy-five companies in the healthcare and medical device technology sectors. The firm invests in companies at every stage, sometimes making seed investments in start-ups and even investing in small cap public companies. Life Sciences Partners was founded in the Netherlands and maintains offices in Amsterdam, Munich and Boston, Massachusetts. Although its foundation dates back to 1982, Gilde Healthcare Partners (GHP) began its specialization in healthcare investment in the early 2000s and has since raised over $1 billion for its specialized investment funds focusing on medical technology, diagnostics, digital health and therapeutics. In addition to its venture capital activities, GHP also manages a lower mid-market buy-out fund, targeting established and profitable healthcare providers, suppliers and service providers that are active in the healthcare market and seeking a majority ownership stake. Founded in the Netherlands, GHP maintains offices in Utrecht, Frankfurt and Boston, Massachusetts. GHP's European origins make it an ideal partner for medical device companies that wish to break into the European marketplace, though the firm's portfolio includes both European and American medical device companies. De Novo Ventures is an ideal investor for medical device companies seeking early stage investment and partnership with a firm focused on the biotechnology and medical devices sectors. De Novo invests in companies that develop drug delivery technology, pharmaceutical products, medical devices, ophthalmology instruments and appliances and biotechnology. The firm typically invests between $8 million and $15 million in its portfolio companies over multiple rounds of investment. Sante Ventures is an up-and-coming force in the world of medical device venture capital. Founded in 2006, Sante is the most recently established venture capital firm on this list, yet it boasts an outstanding record of success given its short history. The founding partners of Sante Ventures previously ran Ascension Health, one of the largest healthcare systems in America with over $12 billion in annual revenue. What began as a $125 million corporate VC fund in 2006 has grown into one of the largest medical technology investment firms in the world with over $250 million invested in 25+ companies over the past decade and 18 in just the past five years. Sante Ventures prefers to act as a lead investor and typically seeks a board seat in its portfolio companies. The firm typically invests between $2 million and $6 million initially in Canadian and American companies, but may invest more over the life of the company. Sante Ventures is headquartered in Austin, Texas. Venture capital firms play a crucial role in the ecosystem of innovation, connecting people and ideas with the financing and resources they need to bring new products in life and improve medical care for Americans and people around the world. 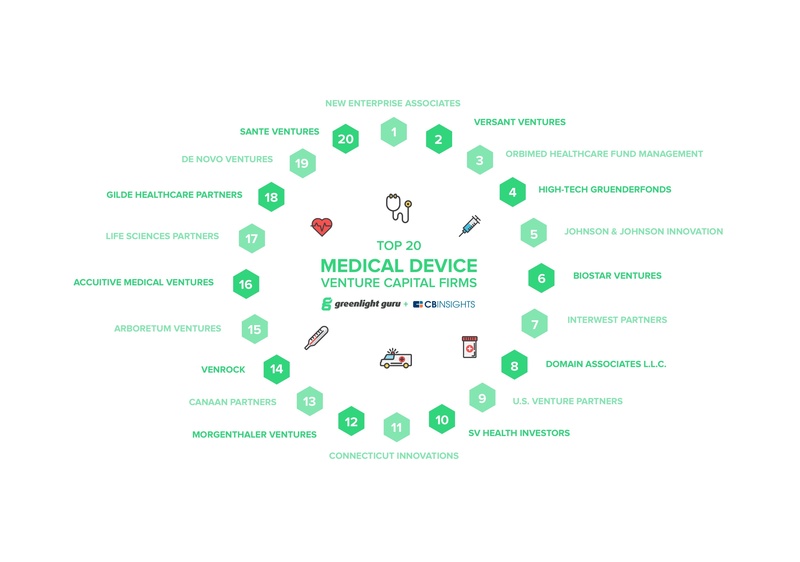 The top 20 medical device venture capital firms all have the financial backing and resources to help you develop your medical device, get to market as quickly as possible, and move ahead with an acquisition or IPO at the right time for your company.